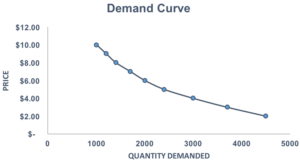 The Demand Curve is a line that shows how many units of a goodInventoryInventory is a current asset account found on the balance sheet consisting of all raw materials, work-in-progress, and finished goods that a company has accumulated. It is often deemed the most illiquid of all current assets, and thus it is excluded from the numerator in the quick ratio calculation. or service will be purchased at each possible price. The priceMarket EconomyMarket economy definition - a pure market economy is an economic system where there are no regulations and players are free to trade as they please is plotted on the vertical (Y) axis while the quantity is plotted on the horizontal (X) axis. 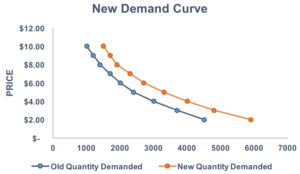 Demand curves are used to determine the relationship between price and quantity and follows the law of demand, which states that the quantity demanded will decrease as the price increases. 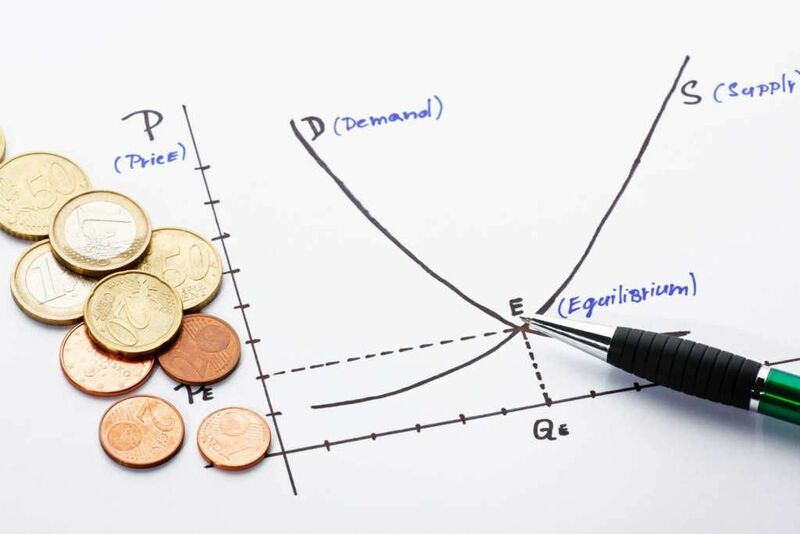 In addition, demand curves are commonly combined with supply curves to determine the equilibrium price and equilibrium quantity of the market. 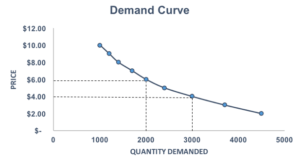 The demand curve is based on the demand schedule. 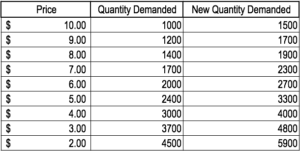 The demand schedule shows exactly how many units of a good or service will be purchased at different price points. It is important to note that as the price decreases, the quantity demanded increases. The relationship follows the law of demand. Intuitively, if the price for a good or service is lower, there would be a higher demand for it. Through the demand curve, the relationship between price and quantity demanded is clearly illustrated. As the price for notebooks decreases, the demand for notebooks increases. If the good is a normal good, higher income levels would lead to an outward shift of the demand curve while lower income levels will lead to an inward shift. When income is increased, demand for normal goods or services will increase. A growing market results in an outward shift of the demand curve while a shrinking market results in an inward shift. A larger market size results from more consumers. Therefore, the demand (due to more consumers) will increase. When the price of complementary good decreases, the demand curve will shift outwards. Alternatively, if the price of complementary good increases, the curve will shift inwards. The opposite is true for substitute goods. For example, if the price for peanut butter goes down significantly, the demand for its complementary good – jelly – increases. Assume that the price of a complementary good – peanut butter – decreases. How would this affect the demand curve for high-quality organic bread? Since peanut butter is a complementary good to high-quality organic bread, a decrease in the price of peanut butter would increase the quantity demanded of high-quality organic bread. When consumers buy peanut butter, organic bread is also bought (hence, complementary). If the price of peanut butter decreases, more consumers would purchase peanut butter. Therefore, consumers would also purchase more high-quality organic bread as it is a complement to peanut butter. We can see from the chart above that a decrease in the price of a complementary good would increase the quantity demanded of high-quality organic bread. Changes in price cause movements along the demand curve. 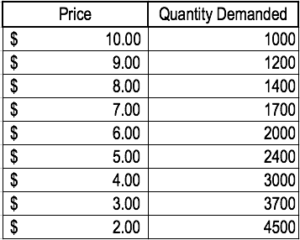 Following the original demand schedule for high-quality organic bread, assume the price is set at P = $6. At this price, the quantity demanded would be 2000. If the price were to change from P = $6 to P = $4, it would cause a movement along the demand curve as the new quantity demanded would be 3000.